The Financial Conduct Authority (FCA) is responsible for the conduct supervision of all regulated financial firms and the prudential supervision of those not supervised by the Prudential Regulation Authority (PRA). The FCA promised an approach that would be judgement led, forward looking and interventionist with a focus on firms’ business models and the potential risks that their activities pose to consumers and financial stability. A productive working relationship with the regulator, and a firm handle on any regulatory changes is important for BIBA members of all sizes. This section of the BIBA website aims to help members do just that. It is dedicated to regulatory and compliance matters and acts as a repository of information for members, allowing them to access the information they want, when they want it. BIBA issues Regulation Updates on a regular basis to alert members to regulatory developments – from the publication of FCA papers to clarity on rule interpretation. Find upcoming compliance forum event dates in the events section. An essential tool written in plain English which not only helps you understand what the rules mean but then how to implement effective compliance within your own firm. The manual is priced at an extremely competitive £495 plus VAT. 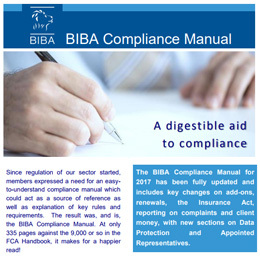 The BIBA Compliance Manual has developed into an industry standard since it was first produced in 2004 in response to members’ demands. This easy-to understand compliance manual acts as a source of reference as well as providing an explanation of key rules and requirements. Each chapter explains in plain English what the rules mean and then provides clear templates in order to help members achieve, maintain and demonstrate compliance. The Manual has been updated to reflect the changes brought in by the General Data Protection Regulations (GDPR) and the Insurance Distribution Directive (IDD), including information on Ancillary Insurance Intermediaries (AIIs). BIBA’s membership operates nationally and internationally. Find the formal information you need about issues arising and doing business in the London insurance market here. The FCA’s website contains an enormous volume of information, but finding what you are looking for is not always easy. This section provides links to some of the more relevant pages for insurance intermediaries from the FCA and other bodies that have a bearing on the industry. Please note: We are sorry, but BIBA is unable to answer questions from members of the public using this email address. Any queries/complaints from customers relating to their individual insurance arrangements should be directed to their insurance broker. The Association of British Insurers and the British Insurance Brokers’ Association launched a joint Code of Good Practice to help insurers and insurance brokers recognise and help potentially vulnerable customers, who may need extra support when renewing motor and home insurance policies.